SAN FRANCISCO — In 2004, Geoffrey Hinton doubled down on his pursuit of a technological idea called a neural network. Loosely modeled on the web of neurons in the human brain, a neural network is a complex mathematical system that can learn discrete tasks by analyzing vast amounts of data. By analyzing thousands of old phone calls, for example, it can learn to recognize spoken words. This allows many artificial intelligence technologies to progress at a rate that was not possible in the past. Rather than coding behavior into systems by hand — one logical rule at a time — computer scientists can build technology that learns behavior largely on its own. The London-born Dr. Hinton, 71, first embraced the idea as a graduate student in the early 1970s, a time when most artificial intelligence researchers turned against it. Even his own Ph.D. adviser questioned the choice. Neural networks had a brief revival in the late 1980s and early 1990s. After a year of postdoctoral research with Dr. Hinton in Canada, the Paris-born Dr. LeCun moved to AT&T’s Bell Labs in New Jersey, where he designed a neural network that could read handwritten letters and numbers. An AT&T subsidiary sold the system to banks, and at one point it read about 10 percent of all checks written in the United States. Though a neural network could read handwriting and help with some other tasks, it could not make much headway with big A.I. tasks, like recognizing faces and objects in photos, identifying spoken words, and understanding the natural way people talk. “They worked well only when you had lots of training data, and there were few areas that had lots of training data,” Dr. LeCun, 58, said. But some researchers persisted, including the Paris-born Dr. Bengio, 55, who worked alongside Dr. LeCun at Bell Labs before taking a professorship at the University of Montreal. In 2004, with less than $400,000 in funding from the Canadian Institute for Advanced Research, Dr. Hinton created a research program dedicated to what he called “neural computation and adaptive perception.” He invited Dr. Bengio and Dr. LeCun to join him. By the end of the decade, the idea had caught up with its potential. In 2010, Dr. Hinton and his students helped Microsoft, IBM, and Google push the boundaries of speech recognition. Then they did much the same with image recognition. “He is a genius and knows how to create one impact after another,” said Li Deng, a former speech researcher at Microsoft who brought Dr. Hinton’s ideas into the company. Dr. Hinton’s image recognition breakthrough was based on an algorithm developed by Dr. LeCun. In late 2013, Facebook hired the N.Y.U. professor to build a research lab around the idea. Dr. Bengio resisted offers to join one of the big tech giants, but the research he oversaw in Montreal helped drive the progress of systems that aim to understand natural language and technology that can generate fake photos that are indistinguishable from the real thing. Though these systems have undeniably accelerated the progress of artificial intelligence, they are still a very long way from true intelligence. But Drs. 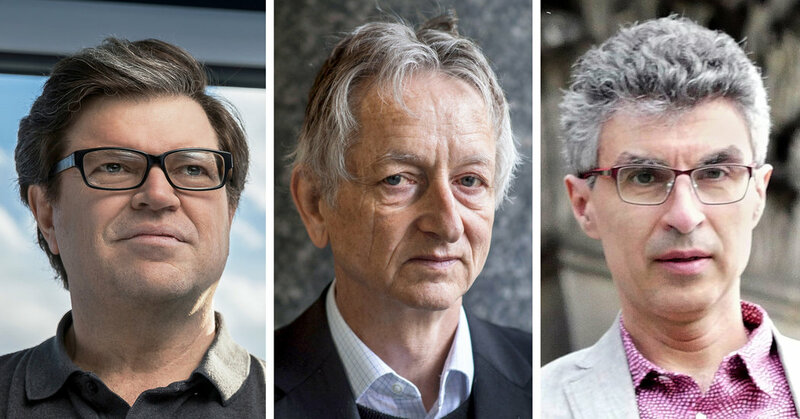 Hinton, LeCun and Bengio believe that new ideas will come. “We need fundamental additions to this toolbox we have created to reach machines that operate at the level of true human understanding,” Dr. Bengio said.